You can learn a lot about yourself when you are hanging from a metal wire in a harness 60ft off the ground Check out a few photos from our adventure course experience. We escaped the Phoenix Valley heat of 112 0F with a 3 hours drive to Flagstaff, Arizona to reach 65 0F. 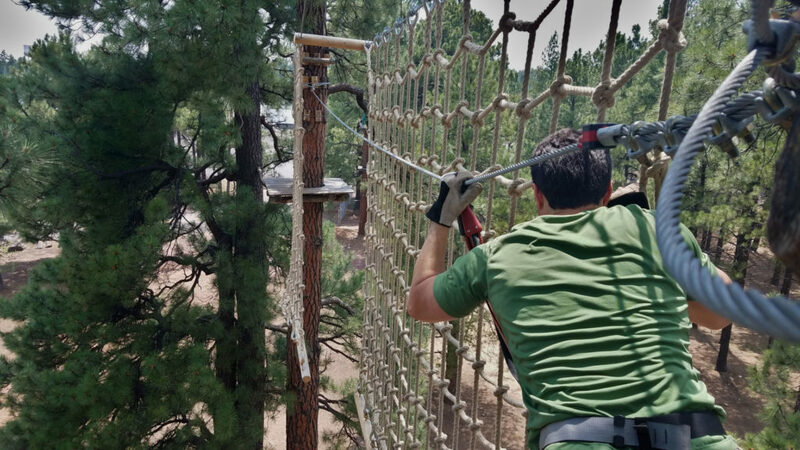 Where we spent multiple hours climbing in the Ponderosa Pine trees. When we arrived we each had to sign a waiver. We were given harnesses that a guide had to approved was on correctly. Next, we attended a 30 min safety/training session on how to use the equipment. Then the guide had us complete a few obstacles on a demonstration course. We learned how to clip ourselves into the safety wire for each obstacle. This is so you do not fall out of the tree. 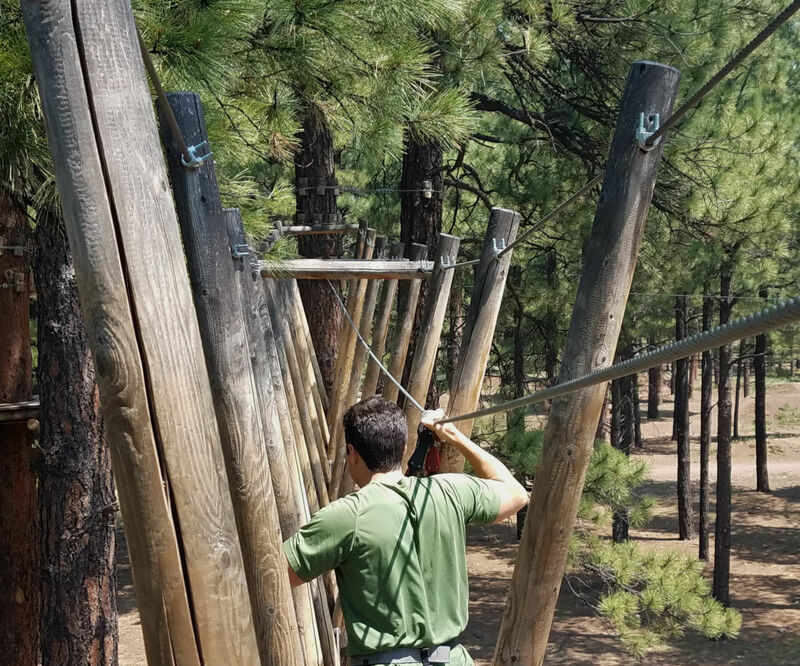 If you are clipped into the safety wire and you fall off the obstacle the safety wire catches you and you climb back up on to the obstacle and try again. Once you pass the demonstration course, you are on your own pace to complete all 5 courses. It took us about 4 hours to complete. 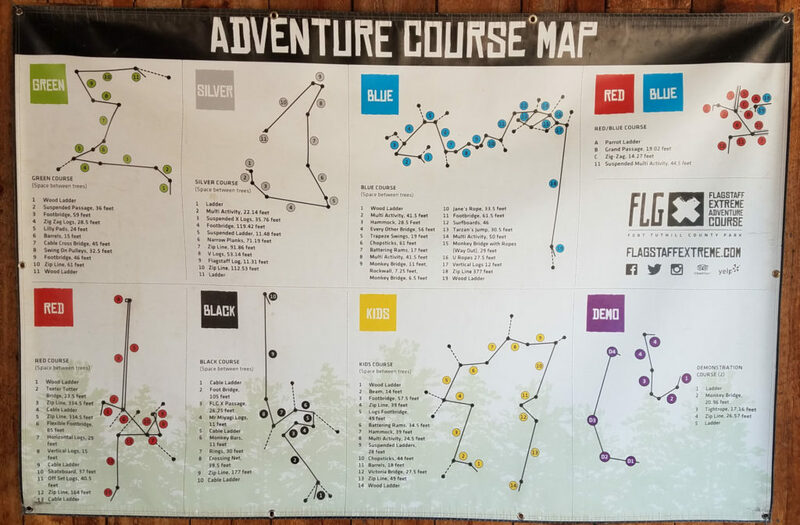 There are 5 courses, each with 10-17 different obstacles. There are obstacles to complete between trees. 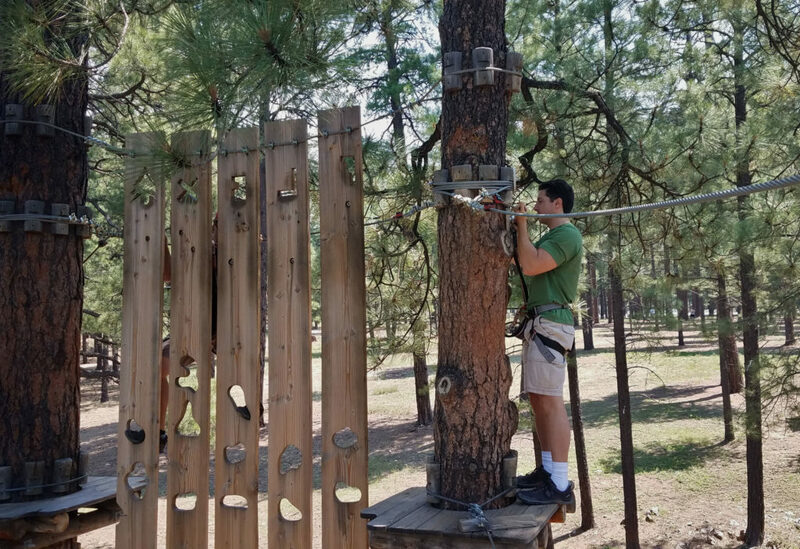 As you progress through the courses, you go higher into the trees and the obstacles get more challenging. Obstacles included: climbing ladders, swing on ropes like Tarzan from a tree to a net and climbed the net, skated on a skateboard, crawl through a barrel, balance on wood planks, jumped on wooden suspended bridges. As you may remember from past blog posts, Hunter loves jumping on suspension bridges. This time we were allowed 2 people on a bridge and could jump as much as we wanted. We did this a lot because I felt safe being tied into the safety line. We had a blast. 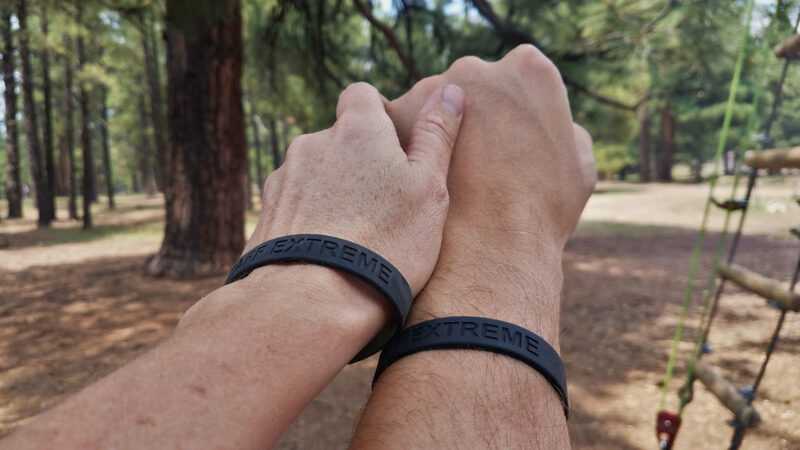 Once Hunter and I completed the 5th (Black) course we received a black wristband signifying that we completed all 5 courses. You must wear closed toe shoes. We choose to wear sneakers. No loose hair that could get tangled in the ropes. I pulled my hair back into a ponytail. No loose clothing. I wore a t-shirt and workout tights. Hunter wore a t-shirt and shorts. I choose to wear a hat to avoid sunburn. We also brought and wore sunblock. I wore my hiking pack with 2L of water. I am glad I did because then we did not have to stop after each course to get a drink. We stayed hydrated in the trees. The company website recommended fingerless gloves. Hunter brought a pair of leather work gloves. I brought my gardening gloves. Both worked great. 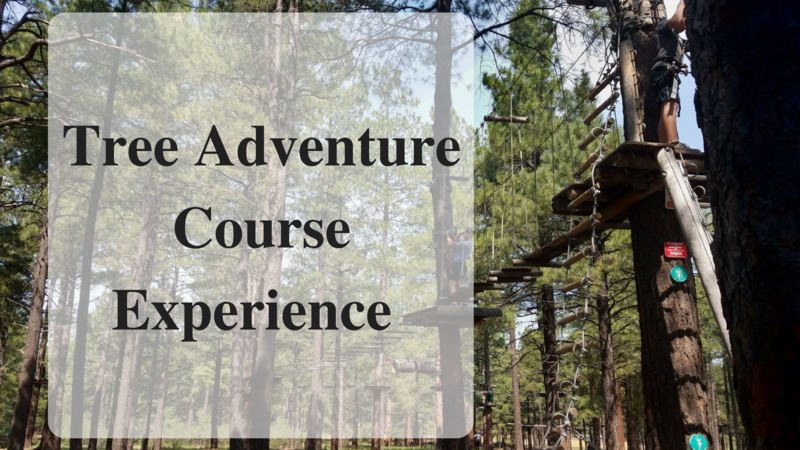 Have you been to an adventure course? Where was it located? What was your favorite obstacle? What a cool experience!! Not super crazy about having my body suspending by a wire..Lol!! I’m a giant chicken . Great pictures would love to see more. Would love to get out of this Phx heat! Trees in Flag look awesome! Thx for sharing! This looks very fun, but a little bit scary. I could probably convince my daughter to try it with me, but not my son or husband! I love the tree rope courses. We have one not too far and even did our daughters birthday party one night there. Great tips and sounds like a great day. This looks like so much fun, and a nice break from the heat. 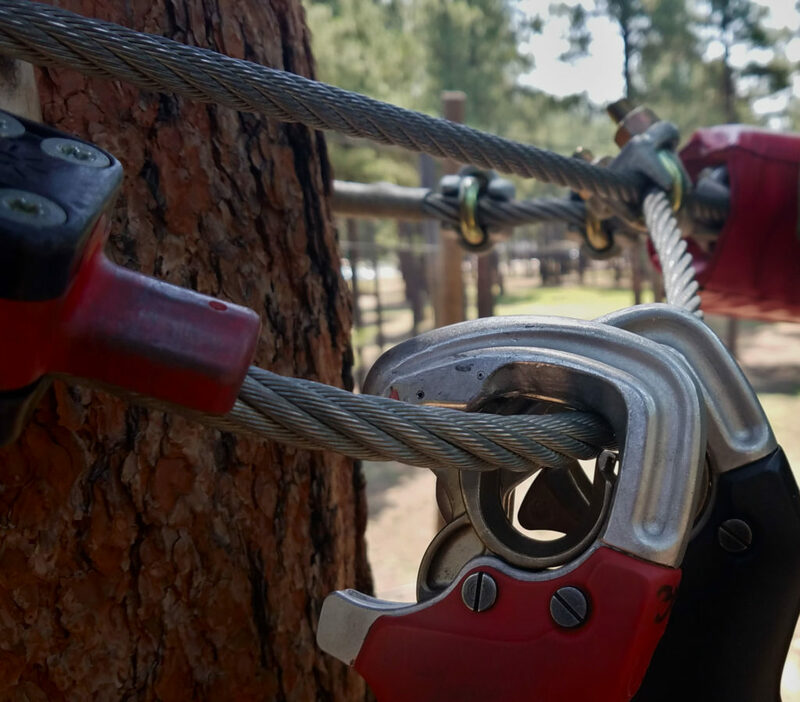 Our family loves ziplines and ropes courses. We’ll have to add this one to our list! So much fun, I love tree adventures! I don’t think that I have ever taken any pictures from this up high though… you rock! That looks like so much fun! I love that there are different levels – and all those crazy obstacles! What an adventure! I like that you get to go at your own pace too. That’s always a plus! I would LOVE doing this. Looks like so much fun! I have not been on an adventure course. It looks like fun. That looks so fun! I would love to give it a try one day soon. Thanks for sharing and capturing the essence of the course in photos.